What an amazing place, so much history. So wonderful to be able to see those old bible pages. Such a beautiful building and the bible is a real delight I can only imagine the hours spent in its making. Finally we have some fine weather so I am making the most of it, gardening. I've always admired illuminated scripts but shall look at them in a different light now I know some of the ingredients used! Illuminated manuscripts are amazing. Just incredible that a calfskin was stretched and scraped to make this amazing surface for calligraphy and illustration (just realised the etymology for illuminate and illustrate must be the same!) and they have survived in such perfect condition for hundreds of years. Your visit to Malmesbury sounds lovely and I hope the football matches went well and you had a win or two. We spent ALL DAY gardening at the cottage yesterday (I was amazed I could get out of bed this morning but it was ok thanks to my allotment training) and today have been out walking on our local chalk Downland where we saw three Peacock butterflies in the beautiful sunshine. I hope to get down to the allotment this week - I have a tray of broad beans that need planting out. Have a good week CJ. It looks like an interesting place to explore. Looks a great place to visit, love the story about the intrepid flying monk! The bible looks beautiful, in fact lots of beautiful windows and architecture. I did chuckle at the flying monk. Perhaps he'd been at the communion wine...we had a grand weekend, and I am still basking in its' after glow. Oh that was nice! Thank you for taking us on a little history tour and sharing your wanderings. I remember the bit about improving color and texture from my studies way back in my own history. I still giggle. I've just come off a long weekend here in tas; spent the first couple of days helping my parents in their garden then came home and did more work in mine! that autumnal deadheading and pulling out, and at dad's, harvesting his apples. great to spend so much time working out doors. what a beautiful abbey - all that glorious stonework. so peaceful! 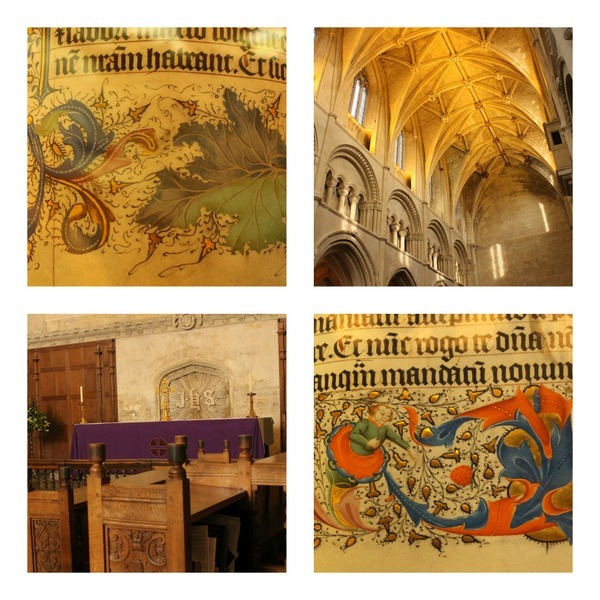 Such a lovely post dear C.J., beautiful images of the abbey and its stonework, the calligraphy and ornate illustrations, how wonderful to live in a country with so much history and beauty. I love the rich history of your country. There are no structures this old in California. You take your kids on such great outings! I am always impressed! Hi CJ, I'm just catching up. I would love to visit this abbey someday. I still can't believe how old things are there. I don't know if I'll ever get used to seeing a 600-year-old building or book. It's amazing to me. Thanks for sharing. 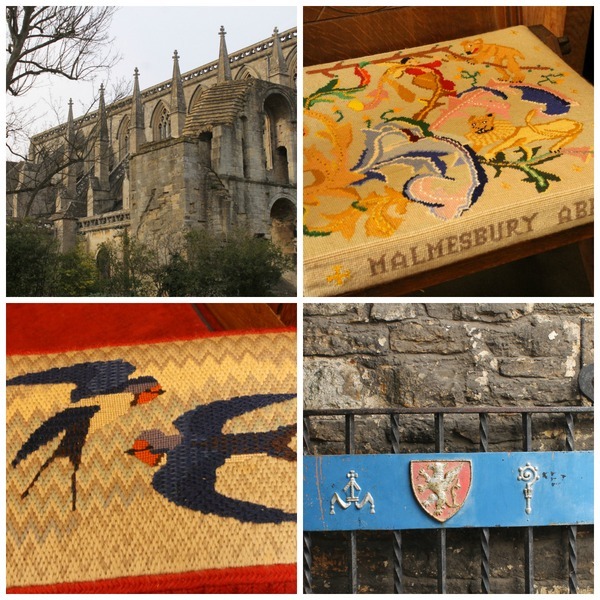 Malmesbury is a place I still haven't visited, and it looks beautiful. Illuminated writing is amazing, isn't it? Although I'm not too sure about some of the ink ingredients. When I was growing up I lived near an Athelstan Road, so it's interesting to hear a bit about him.